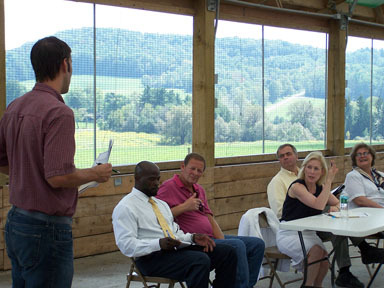 Senator Kirsten Gillibrand visited Jerry Dell Farm yesterday, looking for input on the 2012 farm bill. The crowd had lots of suggestions, from biofuels beyond ethanol to clearer and better-financed farmland protection to making the market for milk make some kind of sense. 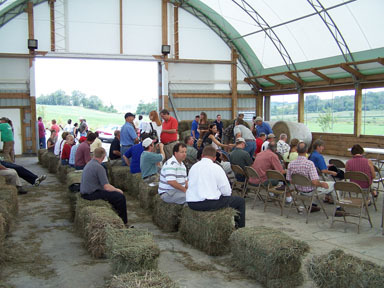 Crowd gathers at Jerry Dell Farm. The Journal reports on the event, but there are a couple of pieces I'd like to highlight. I was pleased that she took the "listening" part seriously, with only a very brief opening statement and extended back and forth with the people talking. She also encouraged follow ups from other people in the audience, which made for a much more coherent conversation than the usual random sequence of statements. Dryden Environmental Planner Dan Kawsnowski asks Senator Gillibrand about farmland protection. She was also pleasantly blunt about some key issues, calling it "pretty outrageous" that imports don't have to meet the same standards as food produced in the U.S., and said she'd "work to level those requirements" in the farm bill. I was also impressed that she described agriculture as a national security issue, and not just in a U.S. vs. the rest of the world way - she was concerned that we need to avoid concentrating everything in a few regions, and make sure that farms in the northeast and southeast continue to operate despite the scale advantages of the midwest and west. The only thing she said that I disagreed with was that we can't get farmland back once it's been developed. True, we can't easily get it back as traditional open farmland for extensive agriculture, but there are still opportunities there for intensive agriculture at least some of the time. I'll write more about that soon. I've posted a gallery of photos of the conversation.